Pingbo Tang, assistant professor in the School of Sustainable Engineering and the Built Environment, is working to enable more efficient and effective use of technology for building information modeling (BIM) and construction management. In construction projects, data collected from remote sensing, video and other tools is used to monitor the progress of the project to compare as-built to the design. Interpretation of the large amounts of data is often tedious and error-prone. Tang’s research focuses on automating visual data collection, processing and interpretation to help accelerate reliable decision-making. Over the last four years, he has performed extensive studies on the utilization of 3-D laser scanning technology for geometric collection of data used for defect detection and bridge management. His work has been funded by the National Science Foundation, Bombardier Transportation, National Institute of Standards and Technology and other agencies. Tang’s interest in the field stems from his experience as a bridge engineer in China. His research encompasses not just the underlying technology, but also how people use it. 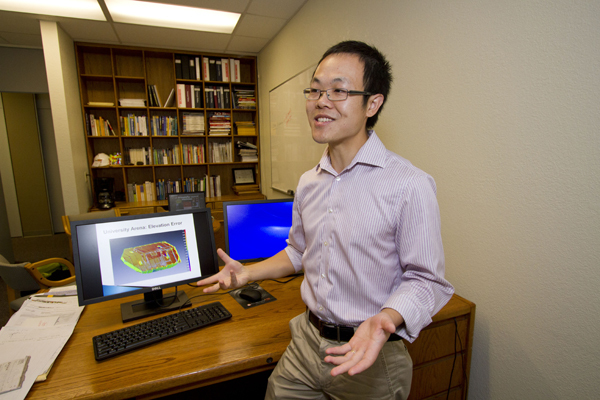 At ASU, Tang leads the SWARM Lab—Sensing, Workflow, Algorithm, Recognition and Modeling of construction systems. He has open positions for construction management Ph.D. students who will be working on interdisciplinary projects focused on spatial change analysis and workflow systems. “We are delighted to have Dr. Tang on our faculty. His focus on advanced technologies in the construction industry promises to improve our ability to meet future societal challenges such as the cost- effective replacement of an aging infrastructure system,”says Edd Gibson, director of the School of Sustainable Engineering and the Built Environment. Tang joined ASU in 2012 from Western Michigan University, where he was assistant professor. Previously, Tang was a postdoctoral researcher at the Mapping and GIS Lab at The Ohio State University. Tang holds a Ph.D. in civil and environmental engineering from Carnegie Mellon University, an M.S. in bridge engineering and a B.S. in civil engineering from Tongji University.